Coco Chanel: the Lion-Hearted Mystic! Dahling, how fabulous that the birth data of fashion legend Coco Chanel is rated AA for 'birth record/birth certificate in hand'! Now we can peek at the birth planets of a creative genius in leisurely fashion secure in the knowledge that 4:00 pm LMT is most likely a round-off hour and could be slightly inaccurate. 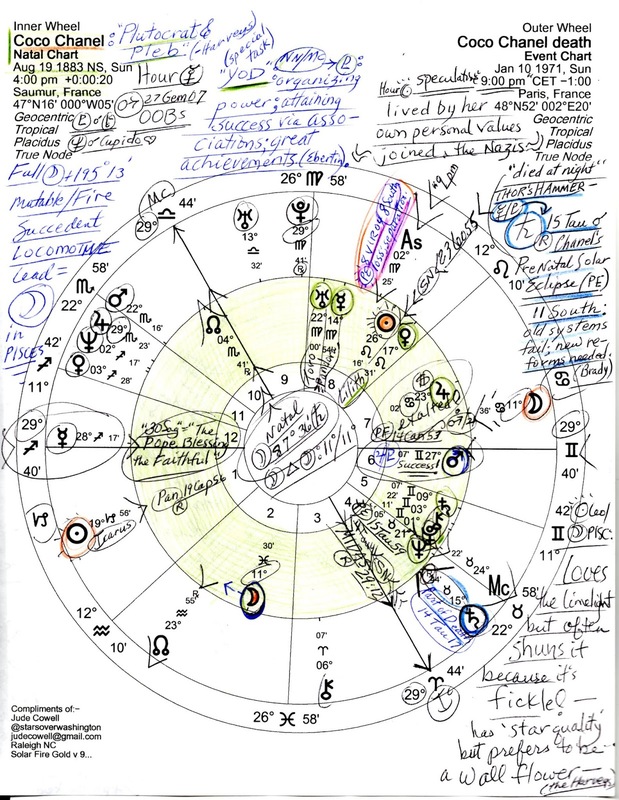 Still, how grand to have what must be a reasonably accurate horoscope for her, and of course studying her chart in tandem with a Timeline of Life Events for designer/parfum maven Coco Chanel (nee Gabrielle Bonheur Cha *s* nel - good hour!) both major events and otherwise significant milestones, can help hone the birth time in if one were inclined to spend the time. Left at an orphanage age 12 along with her sisters by their father, Gabrielle Chanel's childhood is nothing to write home about and her natal Ascendant at a critical-crisis 29th degree of Sagittarius reveals a quick slide into Saturn-ruled Capricorn associated with the father and, her ASC and first house, with early life conditions. Yet gaining for herself a milliner's license in 1910, the former cabaret singer ('Coco') entered the fashion industry bwo Hat Making. For this I cannot blame her for I too have fashioned and sold hats myself in former days, feathers, ribbons, trims, and all. Unfortunately, early conditions in her life created for Coco a bitter personality and she was quite vicious when discussing and criticking her competitors (but honestly, all branches of the Fashion Industry are full of snarling cats--Coco's emblem was the Lion, of Leo fame--her Sun sign, a statue of which she kept close by when working. Rrraowr-r-r! She "clawed" to protect herself, she said, which had to be an early and necessary childhood habit she developed, no doubt. 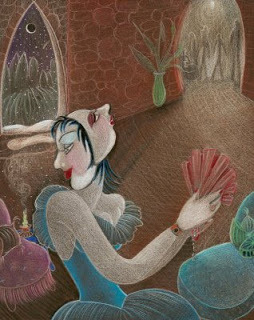 So it's part of her South Node behavior I suppose with South Node in Taurus, sign of greed and intolerance although creativity and patterning talent are strongly emphasized as well along with her creative, mystical Pisces Moon which leads a LOCOMOTIVE parade of her planets - it's a shape of the ruthless executive totally determined on success--here, in the 2nd house of Money, Possessions, Earning Ability, and Values. Plus, there's gold-loving asteroid Midas conjunct natal IC (29Aries). Black was her favorite color but she also preferred white, red, and gold. If you have 10 minutes handy check out a photo montage (with a not too annoying disco loop you can shake your tail feathers to if you so desire!) of Coco Chanel: Transformation from 12 to 87 years old - come for the make-up and fashion, stay for the hats and hairstyles. At the base of the Hammer is a Mercury-Pluto square which suggests deep-seated neuroses, a sarcastic expression, and an acute awareness of other people's vulnerabilities (A. Oken) which makes criticism of others much more deadly and thus more accurate. 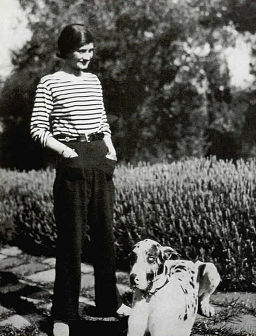 And why is Coco Chanel a "lion-hearted mystic"? Because of her Sun Leo-Moon Pisces personality blend! Devotional, subjective, and moody, a lady who over-dramatized her trevails and played the victim when it suited - and was the originator and promoter of the "little black dress' and of lady's pants and suits! For more personality details see Sun Sign-Moon Sign by Charles and Suzi Harvey. Visit David Cochrane on YouTube! So you know how we once discussed here the natal horoscope of the great bard William Shakespeare? Today I am reminded of the post and his chart because I've just double-checked the natal position of asteroid Shakespeare (#2985; January 3, 1949) and found that its position in relation to my birth was/is 22Cap19:25. 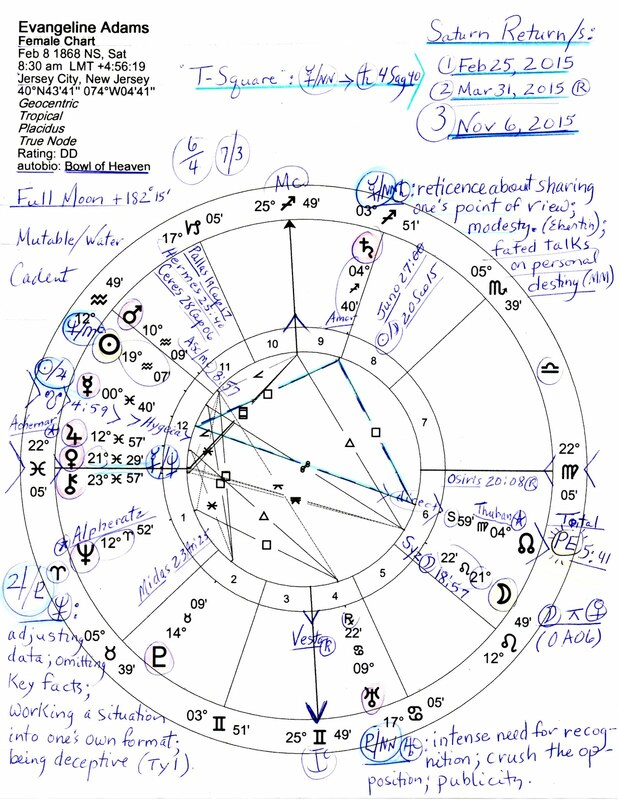 Now as the reader who keeps up with such things knows, that degree of the Zodiac (22Capricorn+) is where the Great Saturn-Pluto Conjunction perfects astrologically on January 12, 2020 (its DC Horoscope shown)...conjunct the natal Vertex of fated encounters of one Mr. Donald Trump. Of course, the point also contains a vibe of wish fulfillment in certain cases but its position doesn't necessarily determine just who or what benefits if a wish is fulfilled. Actually, I don't wish to imagine what could be a wish that must 'welcome' a visit from the compressed, harsh energies of cold Saturn blended with unconscious planet, Pluto the culprit and 'god' of the Underworld which includes the distinct whiff of criminality (organized crime). Would you? But sigh...both planets are considered deeply karmic as what's been sown will be reaped by the one who sews. Saturn's imperatives take about 28 or so years to come to fruition, Pluto never does for an individual except by Pluto's aspects along the way, aka, interactions with our charts/planets. About 248 years for Pluto. As always, all pertinent chart factors should be considered for inclusion for best results. And who knows? Perhaps in these particular legal matters it's Lady Justice whose fondest wish will be granted by the Universe - through the cosmic auspices of Saturn working with Pluto. 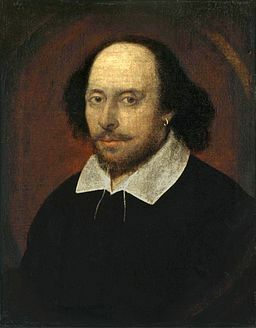 Above image of a portrait of William Shakespeare possibly painted by John Taylor. Beginning with its natal position in the Zodiac, the progressed Moon symbolically advances approximately one degree per month. Therefore, the Secondary Progressed (SP) Moon makes a handy timer for the natal and progressed horoscopes with the SP Moon influencing a particular degree for about one month's duration. If important transits or other progressions conjoin the SP Moon's position at any given time, a fuller picture is created especially when clues are considered such as the natal house through which the SP Moon advances, the SP Moon's sign, the condition of the natal Moon, the pertinent houses ruled by the Moon, and the houses ruled by the planet/s that are being aspected. A example from December 24, 2008 in Political Astrology is America's SP Full Moon @4Vir10 (We the People at critical degree--with SP Sun (leadership) @4Pis10; the SP Full Moon horoscope may be viewed at Jude's Threshold if you wish. This culmination phase in progressions tallied with the Financial Crash of 2008 and on an evolutionary scale marked the limit of America's thrust into the wider world (as our National Treasury was raided). 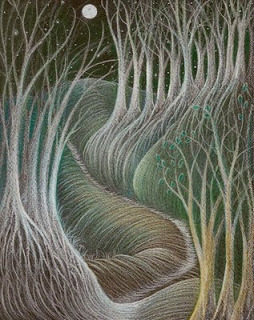 With the public's SP Moon in Virgo, we were critical and suspicious (with good reason) of US leaders who were murky and deliberately confusing on all issues even to the point of deception (SP Sun in murky Pisces as it still is in 2019 with transit Neptune 'chasing' and obscuring it--jc). 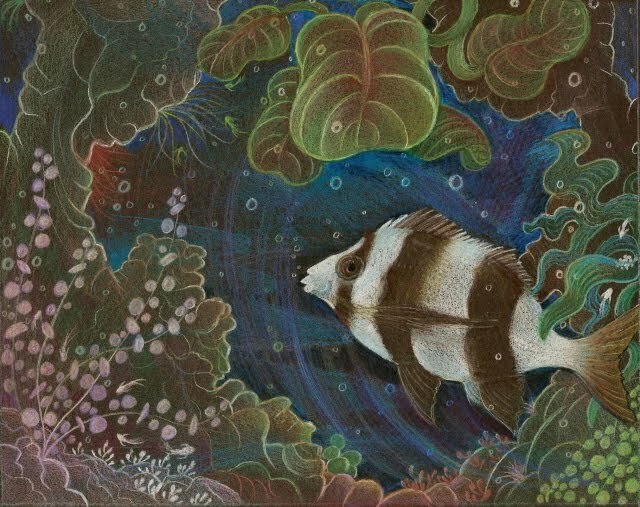 For as you know, Pisces folk have that swim-up-or-down vibe which can express either positively (compassion, spirituality, creativity) or negatively such as theft and fraud, secrecy, scandal, or loss--which is what we got from leadership then as now with SP Sun in Pisces (Donald Trump, grifter and Jupiter-Neptune grand schemer; America's SP Moon as I type is @14Pis25, transit Neptune 16Pisces34). Another Luna-related post is Using the Moon in Electional Astrology which concerns using the transiting Moon as a timer for starting or debuting projects or events--and not necessarily for political purposes. Cardinal signs (Aries-Libra, Cancer-Capricorn) 0 degr, 13 degr, 26 degr; Fixed signs (Taurus-Scorpio, Leo-AQ) 8-9 degr, 21-22 degr; Mutable signs (Gemini-Sagittarius, Virgo-Pisces) 4 degr, 17 degr. Plus, 0 degrees of any sign may act as a critical degree along with the impatient 29th degree. Other degrees are sometimes considered critical due to important events occurring there such as Eclipses, Great Conjunctions, etc. Now critical degrees may not 'work' all the time and their expression is certainly affected by whether there's a transit to that point or another progressed planet joining in by conjunction or opposition. In such cases, the crisis or critical condition may last longer with other planetary involvement but as stated, if it's the SP Moon conjoining a critical degree, approximately one month will be the duration of the strongest influence. Another consideration is the Modality of the affected sign: Cardinal signs tend to work faster and more directly, Fixed signs denote a lagging or delayed affect, and Mutable signs indicate more of a mental or internal influence, plus, fluctuation may be an issue with Mutable signs involved. 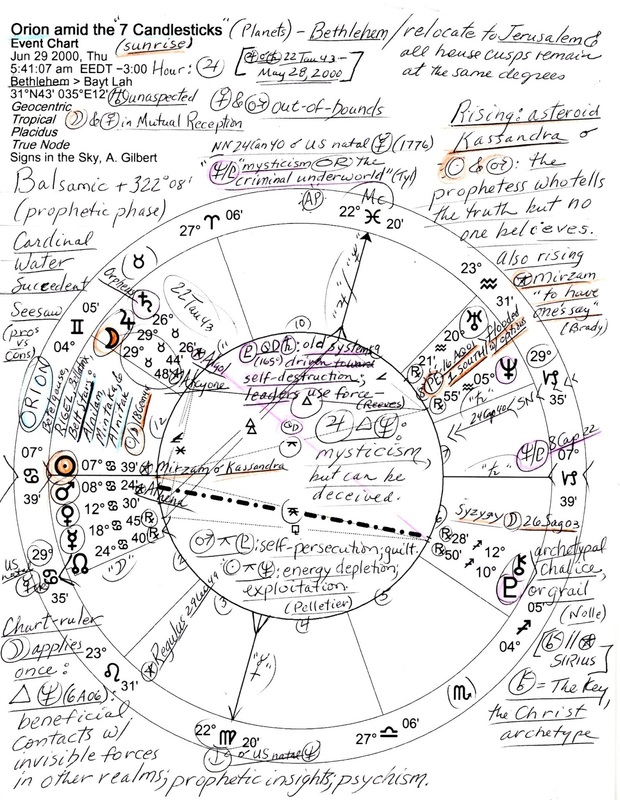 Using the SP Moon in chart interpretation and synthesis is an important tool in the astrologer's kit particularly if the SP Moon triggers a critical degree (which also may hold a fixed star) and so I do hope this post may be of some use to you. 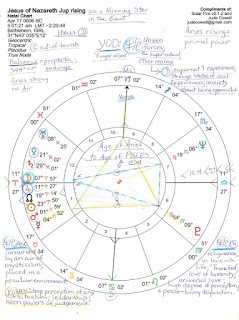 Pictured here is the chart I use as the natal chart of Jesus of Nazareth, based on the date that Jupiter (royalty) arose as the Morning Star and was occulted by the Moon in Aries, sign of Israel and Palestine. Thanks to calendar changes being slightly off, we have "6 BC" instead of the year zero. Since we know that Jesus was born during the reign of Herod the Great (is he on one level Jupiter in this chart being occulted by the Moon? 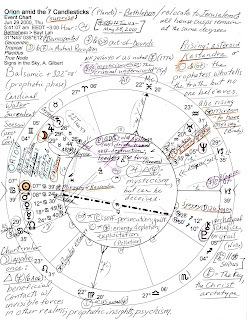 ), the year we call "6 BC" contained the rare occultation (Moon-Jupiter), "7 BC" is known to be when a Great Jupiter-Saturn conjunction occurred in compassionate Pisces--and since lambs are born in the Spring, not mid-winter--these are a few reasons why I use this chart. (There are other speculative charts for the birth of Jesus--see below after this re-post). Moon and Jupiter conjoined at 12:08:22 pm in 9th house (Bethlehem) yet this Jupiter rising chart set for 5:01:21 am is the one I prefer with asteroid, Morya at MC (the Goal or Objective) and Morya having connection with death, and fate or destiny. 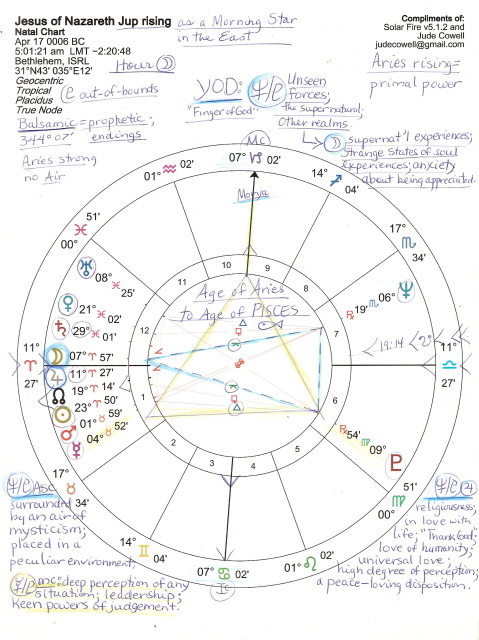 Plus, and as you see, there is a YOD pattern ('Finger of God': special task or purpose; crisis; crossroads--or a turning point from Old Testament to New Testament, old law to new) pointing toward the rising Moon, Ascendant (ASC = Jesus Himself if we accept this chart as His birth chart), and by extension, pointing to royal Jupiter as well. But can modern day midpoint pictures possibly apply to an event from such ancient days? Uranus, Neptune, and Pluto existed although not within people's consciousness, of course. Accordingly, our modern perspectives are naturally different--and time should bring insight, don't you think? Neptune-Pluto = Jupiter: religiousness; in love with life; the "Thank God" position; universal love; love of humanity (I'll say! ); high degree of perception; a peace-loving disposition. Yes, yes, and yes. Mercury-Pluto = MC: great perception of any situation; leadership (why King Herod was so worried--all cruel leaders should be); coping ability; keen powers of judgment; foresight. Sun and Moon were in Balsamic phase of the prophet--a phase of partings and endings. His death was a sad parting, and He brought an end to the Age of Aries as well. People born during the Balsamic phase of the Moon (three days prior to a New Moon) are future-oriented folk who often arrive when something or someone is ending or can't carry on. Progressive, futuristic, rebellious Uranus is in sacrificial Pisces, sign of the Mystic, and love-filled Venus is also in Pisces, sign of her exaltation (universal love.) Jesus certainly disrupted things but from motives of pure Love, the Foundation of the Universe. The Magi, Persian astronomers/astrologers (probably from Babylonia), shared the Aramaic language with the Jews and so they knew of the Prophecy of the Messiah and would have been well able to predict His birth in time to make the journey to the Land of Judah while following The Star of Bethlehem. The unusual occurrence of Jupiter as Morning Star in Aries being occulted by the Moon--in April (Spring, when lambs are born, not December 25, a date chosen by the Catholic Church in Rome to coincide with the pagan Saturnalia festival (and thus bringing goddess worship into the fold bwo the church's elevation of Mary) is quite possibly The Star followed by the Magi. My own thought is that the Great Jupiter-Saturn Conjunction/s may have been The Star itself, with the Moon-Jupiter-Morning Star phenomena as a timing device for the birth of the Prince of Peace. Jupiter represents the generous side of God (His staff), while Saturn represents God's disciplinarian side (His rod.) On one level, we may relate "Thy rod and Thy staff, they comfort me..." in The Lord's Prayer directly to the natural law of Jupiter (expansion) and Saturn (restriction) being the fly-wheel of the Universe for the tension between them keeps the planets in their courses. Yin-yang, positive-negative, dark-light, the dualism of our world...the balance between planets Jupiter and Saturn are a constant comfort to me and I hope to you as well! As the children's song says, "He's Got the Whole World in His Hands"! Well, that's what I wrote and published on December 24, 2007. Tonight is December 23, 2018 and I shall add other data to our speculation concerning the Birth of Jesus of Nazareth including data from the book by coin collector and astronomer Michael Molnar, The Star of Bethlehem: The Legacy of The Magi with details on how The Star has been studied through the centuries by Kepler and others, and how he, a Rutgers astronomer, became interested in using astrological data because of images on an ancient Roman coin he purchased for $50 which depicted a ram (Aries, symbol of Judea) "looking back at the star." Well, since The Magi, aka, "The Three Wise Men" were Eastern astrologers, I agree with the significance of the coin's symbols and the value of Astrology in the matter! Yet I don't remember where I found the data to calculate the horoscope shown above, but Mr. Molnar and I agree that the chart very well could be accurate with royal Jupiter rising and occulted by the Moon in Aries. There are multiple versions of a Natal Chart for Jesus of Nazareth based on a variety of dates, historical facts, and cosmic conditions. One horoscope championed by astrologer Christine Arens is set for May 29, 007 BC 5:36 am LMT Bethlehem> Bayt Lah. 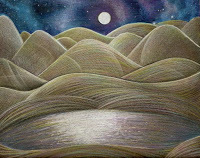 Rising is 14Gemini23 with Sun rising @4Gemini14 and Moon 4Gemini31, a New Moon in Gemini, sign of 'the Good News'. Gemini rising makes the sign's ruler, Mercury, chart-ruler and Mercury (planet of youth and children) is at a critical-crisis 29th degree--of Gemini, followed by Venus @6Cancer29 (these two are the 'shekinah planets': the dwelling or divine presence of God on Earth). And astrological Venus in Moon-ruled Cancer denotes deep seated feelings of love! Through the years, comets, or the Great Conjunction of Jupiter and Saturn have been proposed to be The Star of Bethlehem followed by The Magi. Well, conjoined @20Pisces are Saturn and Jupiter in its traditional ruler-ship of Pisces, sign of the Two Fishes, one swimming up to the heights, one swimming down to the depths which echoes the basic choice we each have in life for it symbolizes good vs evil, light vs dark, and the path we have the free will to choose. For believers, the Words of Jesus (who was The Word! Our Universe began with sound waves that some call 'The Big Bang') while He lived on Earth were of a critical-crisis nature and His birth Was the Good News! So if you wish, read about the intriguing research based on Scripture and Astrology by Christine Arens who asks, Was Jesus a Gemini? 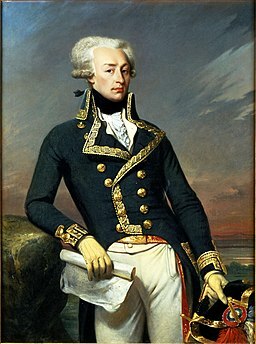 Now of course, until the discovery of Uranus in 1781, Saturn was the outermost planet in our Solar System, 7 total, and some traditional astrologers do not use Uranus, Neptune, or Pluto in their horoscopes. Fortunately, I am not one of them and consider the three more recently discovered planets to add much to the analyses of Historical Horoscopes (naturally they existed on an unconscious level during the particular era in question). Therefore, the dynamic T-Square in the May 29, 007 BC chart seems of interest since it is formed by the opposition of Uranus and Pluto which both square the Gemini New Moon. Squares (90 degrees) represent blockages or obstacles and I shall add here a note about the lucid dream I had years ago involving Astrology when upon waking an angel said to me that, "squares form due to essential quests." Well, if this is true, Baby Jesus, as symbolized by the Gemini New Moon (when solar consciousness and lunar unconsciousness blend perfectly together), was facing a life of serious difficulties, as believers know came to pass. For the Uranus-Pluto pair in Astrology signify potentials for "revolution, the process of transformation, and the collapse of the old order, construction of the new" (R. Ebertin). Yes, New Testament times and a Bringer of the New Law had arrived! Ascendant 18Scorpio21; Midheaven ("MC' = Aspiration; Goal) 24Leo42; Sun 25Leo10, Moon 2Cancer48, Mercury 6Virgo48, Venus 11Libra40, Mars 3Scorpio37, and Jupiter 22Pisces36 Rx. Saturn, associated with ancient lands such as Judea and Palestine, is also in mystical Pisces (rather than in signs it rules, Capricorn or Aquarius) and yet here Saturn is ruled by The Great Benefic Jupiter, although their conjunction has a wider orb: 22:36 and 20:32. Plus, the orb of the Uranus-Pluto opposition is wider than in the Gemini New Moon chart although both are in the same signs across the victim-savior axis: Uranus Rx @4Pisces and Pluto @9Virgo so no T-Square is formed in the "perfect" chart because Sun is in royal Leo and Moon in nurturing Cancer. Yet it is a blend with a deep sense of integrity. We should also note that the planet of The Divine Source, Neptune, is posited @2Scorpio and conjoins the South Node of the Moon, a karmic point. Actually, the Neptune-SN conjunction is quite descriptive for it signifies the ability to 'sidestep the folly of the masses through superior wisdom' and suffering loss via 'intrigue or unfortunate circumstances' such as betrayal or theft (Sakoian-Acker). Well, yes. Note that otherworldly Neptune also conjoins warrior planet Mars in Scorpio (sign of betrayal in and of itself, plus, the occult, and the scarab beetle of Egypt). 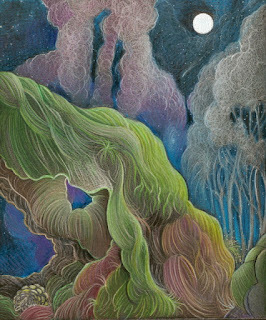 This conjunction tends toward a strong amount of psychic magnetism, an air of mystery, the use of occult power, great healing ability, and lofty spiritual attainment. Now the last data in my files for a speculative Natal Horoscope for Jesus of Nazareth comes from another book, this one by Adrian Gilbert: Signs in the Sky: The Astrological and Archaeological Evidence For The Birth of a New Age. Perhaps you're familiar with Mr. Gilbert's work from his other books, TV appearances, or videos. Here's a link to his video Signs in the Sky Part One: Egypt (31 mins) but also check out Part Two: Israel in which he and fellow seekers view the prophetic planetary alignment of June 29, 2000 foretold in Scripture as "the seven candlesticks" (7 planets) with constellation Orion, archetype of Christ (the Alpha and Omega), standing amid them, hand outstretched (toward the Sun at His Ascension) in the 'stargate' or "shaking hands" position (horoscope shown below). These days, Orion rises over the Mount of Olives in Jerusalem. So if such topics interest you, I highly recommend Signs in the Sky in which you'll find dates for other life events of Jesus of Nazareth which are listed as "stellar signatures": His Crucifixion (April 15, AD 29--I use 6:00 pm LMT), Resurrection (April 17, AD 29), and Ascension (May 27, AD 29) along with other dates for events in the life of Jesus. And you may be assured that these dates are not just pulled out of a hat, for Adrian Gilbert explains to you exactly how he arrived at them and can do it much better than yours truly! 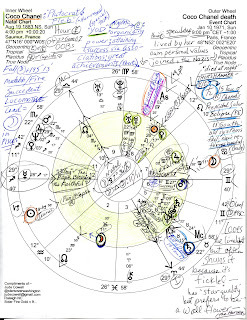 Please enlarge the image to read my (messy) study notes and perhaps later on I may add some text to go with the June 29, 2000 Horoscope but for now, my 'blogging break' must end and holiday preparations for out-of-town guests shall begin! A Grateful Shout-Out goes to a certain astronomer at The Lowell Observatory (famous for the 1930 discovery of Pluto) whose interest in my 2007 post on 'A Speculative Birth Chart for Jesus April 17, 006 BC' inspired both this updated post with additional data and my purchase of Michael Molnar's intriguing book.